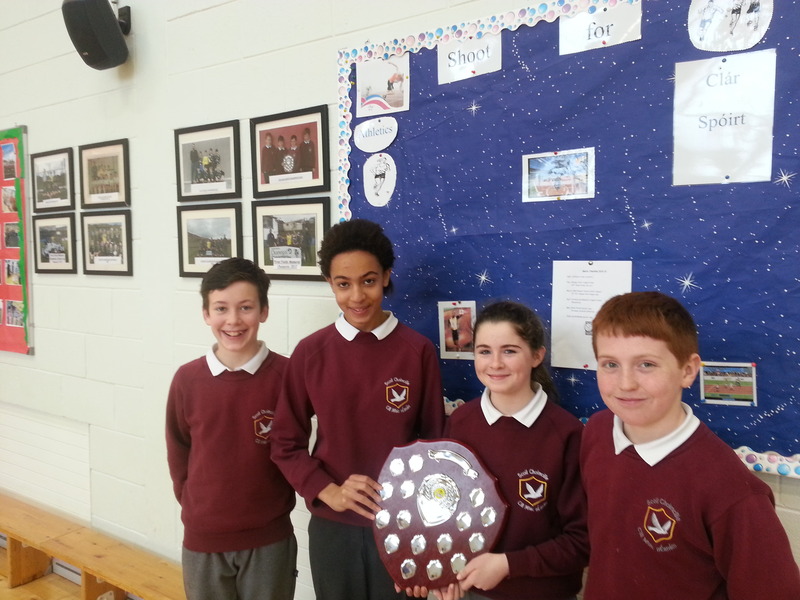 Kilmacrennan NS won the recent County Primary School’s (Garda Quiz) title on the 8th March 2018. Congratulations to John-James, Jack, Éilis and Dan on a great achievement. This is the third title won in 2017-18, along with the GAA Cumann na mBunscol County Title ( John-James, Jack, Éilis and Dan) and the LK Credit Union U-13 title. 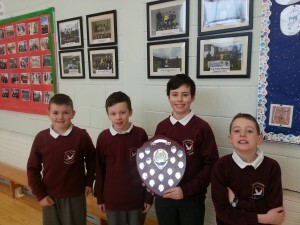 The victory in the Cumann na mBunscol quiz event completed a five-in-a-row for the school in that competition. Letterkenny Credit Union hosted their annual quiz in the Mt Errigal Hotel in late January 2018. A number of teams from the school participated in the event. Following an engaging contest, our U-13 team- Jack, Jack, Dan and Éilis – emerged victorious on the night and will participate in the Donegal, Derry and Tyrone Chapter Finals in March. One of our U-11 teams- Grace, Lennie, Aisling and Hannah- finished in 3rd place, a mere two points behind the winners. 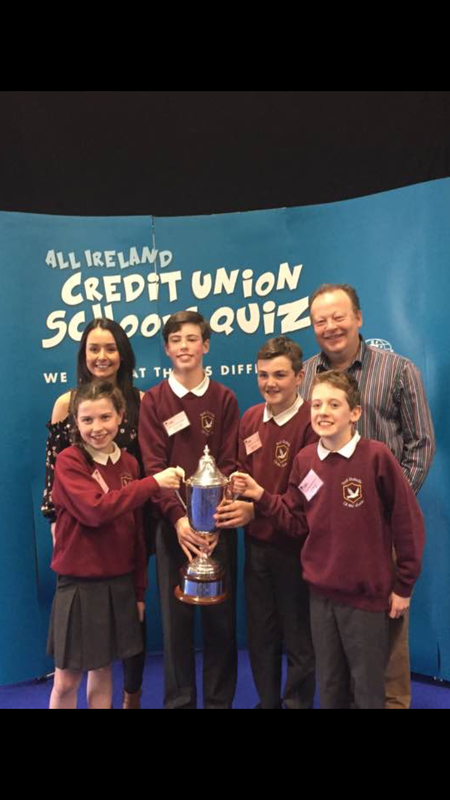 Congratulations to our U-13 quiz team of Ronan, Eoghain, Thomas and Eilis who won the All Ireland Credit Union Quiz Final in the RDS in Dublin on Sunday, April 2nd. The team battled their way through stiff competition in the Chapter Final in the Mt Errigal to claim a place in the final. Over 5,500 teams initially entered this 32 county quiz, with over 20,000 children competing in the event. Kilmacrennan School represented Letterkenny Credit Union in the National Finals and this event was hosted by Aiden Power. The Cumann na mBunscol 2015-’16 County Quiz was held in the Mt Errigal hotel in November 2015. Kilmacrennan school were winners on the night and qualify for the Ulster Finals due to be held in March 2016. Comhghairdeas le Ciarán, Ella, Eoghain agus Thomas. Congratulations to our quiz teams on finishing 2nd and 3rd in their respective categories in the local Credit Union quiz. A great all-round performance. 2014 ALL IRELAND CREDIT UNION QUIZ FINAL. Congratulations to our successful Credit Union Quiz teams this year. 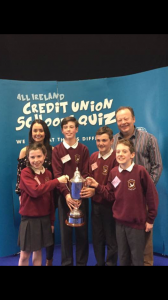 Having won both the 2014 Letterkenny Credit Union Quiz (78 teams participated), the U-11 and U-13 teams then won the Chapter Final (teams from Donegal, Derry and Tyrone participated). They thus qualified for the All Ireland final, held in the RDS in April 2014. All roads led to the RDS on Sunday 6th of April for the All Ireland Credit Union Quiz Finals. Both teams enjoyed a great day, finishing a mere four questions behind the winners. Both teams were also the best performers from Ulster at the event. 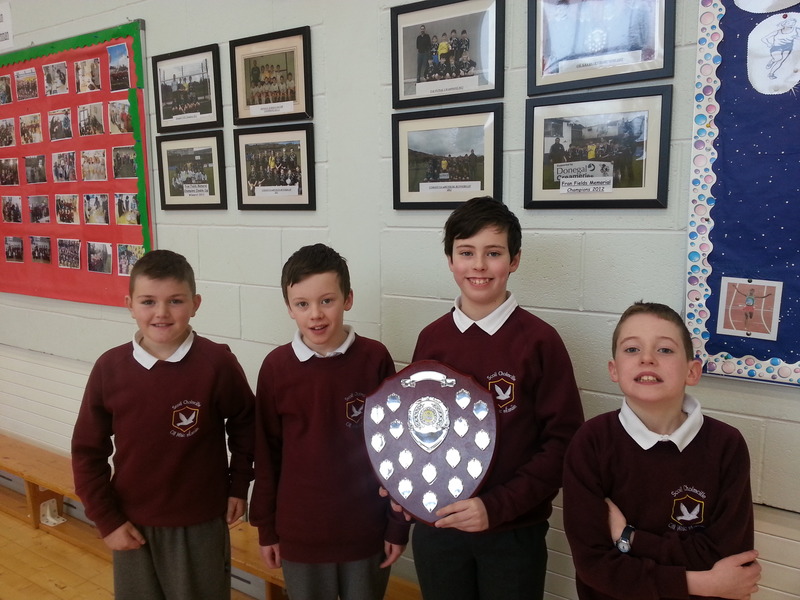 CUMANN NA MBUNSCOL ULSTER QUIZ CHAMPIONS 2014. Having won the Co. Donegal Cumann na mBunscol Allianz Quiz final recently, the team then represented the county in the Ulster Finals in Irvinestown in March 2014. Well done to Ciara, Manus, Meabh and Conor on a great performance on the day. They finished three points clear of the 35 other teams who had qualified, thus capturing the Ulster title. On the same day as the Ulster Quiz final, a team from the school participated in the divisional finals of the Garda Quiz. Daniel, Harrison, Grainne and Conor represented the school in this event and, in a similar vein to the other school team participating that day, they too won, finishing in first place. They will now compete in the Garda Quiz County Final in April 2014. The two U-13 level teams put in great performances in finishing 1st and 2nd respectively in that section. The U-11 teams also excelled in their section with both teams finishing in 3rd and 4th positions. This was a great achievement considering that 92 teams in total took part. The U-13 team who were victorious will advance to the Ulster chapter of the quiz in the forthcoming weeks. 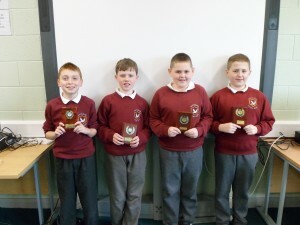 The school won the NW and Donegal Cumann na mBunscol Quiz Finals and represented the county in the Ulster Final in Armagh on Thursday, 24th March. They defeated representatives from the nine counties of Ulster to claim the coveted provincial title. Well done to Marie, Shane, Anthony and Eoin.